Finishing your basement is a cost efficient way to increase your home’s living space and value. While an addition to your home includes costs such as foundation work, ground and site work and sometimes even roofing work, a professional basement finish can be a much more affordable project that utilizes the space you already have. 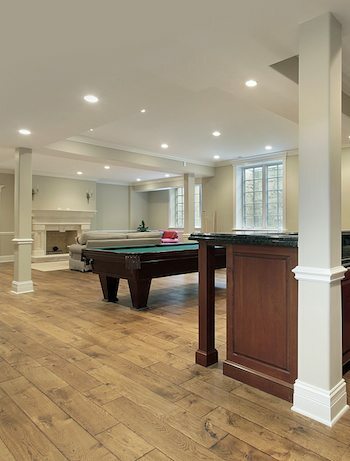 Basement finishing can help many homeowners realize their dreams of having additional space to work from home or extra living space through an entertainment room or family lounge. The qualified contractors at DeLuca Home Improvement are experienced and fully equipped to take care of the entire basement finishing from start to finish. When you choose us to remodel your unused or out-of-date basement, you can expect informed and experienced basement specialists who will prioritize your needs and opinions. With a dedication to superior customer satisfaction along with excellent craftsmanship, DeLuca Home Improvement can craft your existing basement into the functional space you’ve always envisioned. If you have any questions about our basement finishing and remodeling services, or if you would like to schedule a consultation, contact us at 203-791-8345 today. DeLuca Home Improvement is a basement contractor offering finishing, remodeling, and more to Danbury, Newtown, Ridgefield, Wilton, Bethel, Brookfield, New Fairfield, Weston, and surrounding CT communities.